So I have a Dover reprint of S.F.A. Caulfeild’s Dictionary of Needlework . (Dover gave it a new title: Encyclopedia of Victorian Needlework . It’s a fine reference work for its time. This means it’s full of terms for various bits of needlework that have different names now, and what we would probably now consider bogus bits of history. Probably large portions of it are accurate; I’m not well-read enough to know all of which bits are which. If you can decipher older terminology (or are willing to give it a try), there’s interesting designs in it for knitting, crochet (including Tunisian crochet), tatting, needle lace, bobbin lace, embroidery, and lots of other stuff. 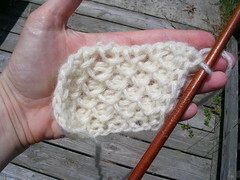 It’s hard to figure out what the needle sizes are, and I find the weights of yarns indecipherable. (I haven’t bothered to do the research yet; I imagine there’s a historical reproduction group on Ravelry that would be able to help me out.) It’s an English book, and so the crochet terms are closer to the modern English crochet terms (i.e. 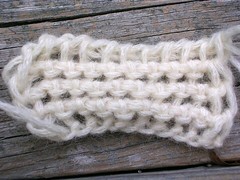 English double crochet stitch = US single crochet stitch).